Your strengths are not what you’re good at, and your weaknesses are not what you’re bad at. If you’re good at something, but it drains you – that’s not a strength, that’s a weakness. A strength is an activity that makes you feel strong, just as a weakness is an activity that makes you feel weak. A strength draws you in, and you know better than anyone else what your strengths are. And if you don’t, then it’s time to learn. You’re the only person who can take this advice, own it, and put it into play in your own life and work. If you can do that, then you can build a life that is a true and beautiful reflection of the very best of you. WOO, EMPATHY, COMMUNICATION, INTELLECTION, POSITIVITY. My top 5….. Figuring out how to create a career I love at 59 is a real challenge. ? What would you charge me if I come to LA and talk person to person for an hour ? There are many strengths coaches that can help you figure out this dilemma. There is no need to go directly to Marcus. As a start try recording when you feel energized and what drains you throughout the day for a week. It helped me discover that while I love working with data and numbers expense reports were the bain of my existence. 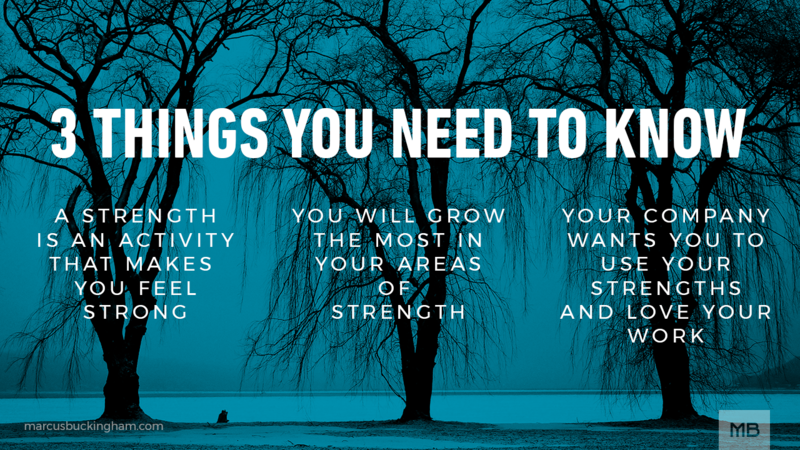 So, it is a good exercise to learn more about what your strengths are to begin with. Then reach out to a strengths coach to have a discussion. When you find that sweet spot at work it is awesome.